Carmen Porras has the patience of Job. 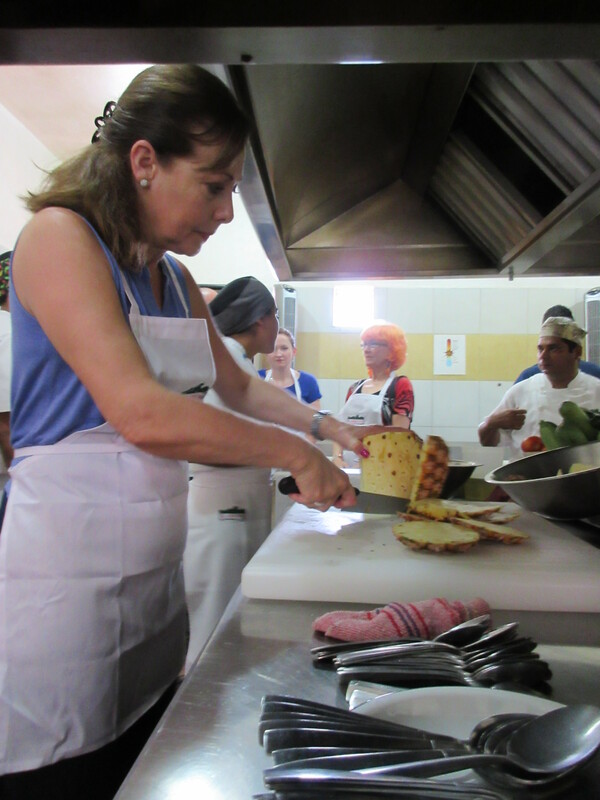 She invited a group of travel writers into her restaurant to try our hands at cooking some traditional recipes. My friend Linda Spanberger traveled with me for this wonderful trip and together we all crowded into El Arrayan’s kitchen to try to capture a bit of the magic of the wonderful aromas coming out of the small space. El Arrayan has been open for 12 years and is owned by Carmen and her partner Claudia. Divided into teams with kitchen staff – who probably couldn’t wait to see us head down the road – we learned (loosely worded) how to prepare a zucchini mix that is a little like one my mom taught me that we dish up every summer. We also had an adventure in tamale preparation. 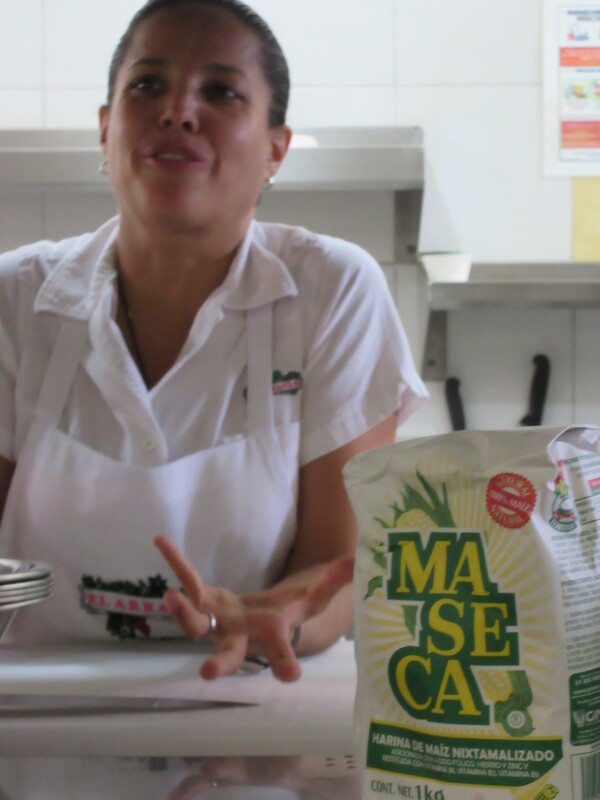 Chef Diego, who was recently promoted from sous chef introduced us to Masa which Carmen Porras explained is basically dough for corn. The complicated mole sauce had already been created although they were kind enough to share the recipe. We made tamales using banana leaves to wrap the chicken, mole and masa mix. The tamales were wrapped and tied which sounds much easier than it was. The tasty, time consuming, tamales were then stacked upright and steamed. For dessert we created a delectable pineapple glaze that was served over ice cream. Lovely Linda turned out to be a whiz at cutting pineapple and her efforts even turned up in the film covering our trip. Working in the hot kitchen was almost too much for several writers who had to duck out from time to time for a breeze. We learned to appreciate how hard the staff works to make dishes we sampled during out trip. This was a great experience making me feel like a member of Top Chef, it will be long remembered and I recommend doing this if you happen to find yourself in Puerto Vallarta. Log onto http://elarrayan.com.mx/en/kitchen.php for details. At home, I hope to try to recreate a much simpler version of El Arrayan’s traditional dishes although I don’t think they will have a clue of the wonders that Linda and I tasted in our cooking adventure! Next Post: Ah the food, the views and the Mariachi bands – Puerto Vallarta style.